4Life Inner Sun™ - A Unique Formula Based on St. John’s Wort, Inner Sun Provides Support to the Nervous System. A Unique Formula Based on St. John’s Wort, Inner Sun Provides Support to the Nervous System. Support your day with this natural mood enhancer. Stressed out? Nervous? Anxious? Frazzled? Are you as happy as you want to be? Or, are there times when you just find yourself “singing the blues”? 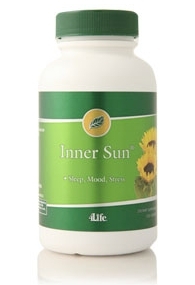 Inner Sun is a product utilizing St. John’s Wort in a synergistic proprietary formula designed by 4Life® to help support healthy stress levels and promote a healthy mind and body in these hectic times. St. John’s Wort, or hypericum, was discovered to have beneficial properties over two millennia ago. Europeans and Asians who have since rediscovered the effectiveness of St. John’s Wort have used it for over fifteen years. In the United States, recent media attention has drawn considerable attention to this simple, yet effective herb. Besides St. John’s Wort, Inner Sun’s other natural ingredients include chamomile, hops, rosemary, hawthorne and B-vitamin complex. 4Life®’s potent blend of ingredients offers an overall feel-good formula. The combination of all-natural herbs provides healthy stress level support. Inner Sun helps you your day—just what you need in such a hectic, tough world. If you are like millions of other Americans affected annually by depression, sometimes keeping afloat in life feels like a never-ending battle. Inner Sun can help give you the advantage you need to keep moving and succeeding. Inner Sun features the clinically proven herb St. John’s Wort. I take 4Life products to help with my symptoms of fibromyalgia. I take Transfer Factor Plus and both the Fibro AMJ formulas. I’ve also added other products. I added the BioEFA, CM Super, SleepRite, and Inner Sun. My depression has lifted. I’m able to sleep most of the night. Before using these products, I had been waking up several times a night and not being able to get back to sleep. I am really grateful for 4Life Research.